A Monster Calls is a young adult book with a deceptively simple plot – a thirteen year-old boy wakes up in the middle of the night and discovers a monster in his back yard – that reveals an unparalleled depth of emotion and storytelling prowess. Patrick Ness, working from an idea by the late Siobhan Dowd, takes that simple start and builds it into a novel that I would argue is a modern masterpiece. The first complication to the story is that the boy, Conor, lives alone with his mother, who has been sick for months. She is in and out of the hospital, trying new treatments, bald and thin but always firm in her belief that the next treatment will do the trick. Over the course of this up-and-down cycle of treatment and relapse, Conor has become withdrawn and angry. He’s bullied at school and outcast from his peers by their knowledge of his mother’s sickness. Then one day a monster wakes him in his room at 12:07 AM. The monster comes as a walking yew tree – the very same one that watches over Conor’s house from a nearby graveyard – but it is an ancient thing, older than the tree and apart from it, taller than his house and powerful enough to knock holes in the walls. Conor, strangely enough, is unafraid, because it “isn’t the monster he was expecting”, and he’s “seen much worse” in his horrible recurring nightmares. The monster, only momentarily taken aback, smiles its evil, leafy grin and informs Conor that it will tell him three tales and then he will return the favor with a tale of his own. Thus begins the meat of the story, and it is quite a story at that. Ness weaves together fairytales, horror, fantasy and the crushing banalities of modern life in a strange and compelling novel that packs an incredible emotional punch. The book is illustrated throughout with stark black and white paintings that splash across the pages, bleeding into the margins and evoking just enough of the story to fill in the corners of your imagination. The monster looks like something you might find hiding in the darkest shadows at the back of a closet, and its head is a bundle of spikes that could either be twisted branches or alien spines. As I read the last few pages of the book, I had to stop several times to get my emotions under control. In fact, the book affected me that strongly several times throughout. It’s a powerful story with an ending that lingers long after the last page is done. 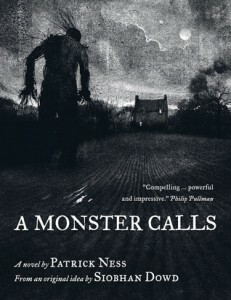 A Monster Calls is sold as a young adult book, but I think Ness tells a universal story here, one that could – and should – be appreciated by readers of any age. It’s an intense experience, but well worth it. Very highly recommended.